Merlins Lodge in Long Bennington, near Newark sleeps 4 people. 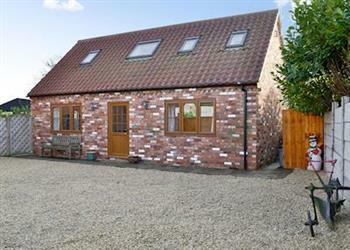 Merlins Lodge near Newark is tucked away at the end of a lane next to the owner’s farmhouse and offers ideal accommodation for those looking to get away from it all. The location makes for easy access onto the A1 making this a great base for those wishing to explore the area. There are many places to visit with the thriving market town of Newark being just 6 miles away which holds many events on its showground, including regular international antique fairs that attracts buyers from all over the world. The local area has good country pubs for refreshment and food as well as being close to the city of Lincoln, Stamford and Nottingham, which is great for shopping and cricket. There are many great walks to enjoy, including for pets, straight from the door as well as cycle routes throughout the area. After a busy day exploring this glorious county, return to the comforts of Merlin’s Lodge to relax in the welcoming hot tub. The shop, pub and restaurant are 1½ miles from Merlins Lodge near Newark. Living area: With 40’’ Freeview TV, DVD player, CD player and wooden floor. Bedroom 2: With twin beds and low ceiling. Oil central heating, electricity, bed linen, towels and Wi-Fi included. Welcome pack. Enclosed courtyard with sitting-out area and garden furniture. Hot tub for 4 (private). Bike store. Private parking for 2 cars. No smoking. Pets allowed at Merlins Lodge. For a better idea of where Merlins Lodge is, you can see Merlins Lodge on the map below. Merlins Lodge is in Lincolnshire; should you be on the lookout for a special offer, you can find all the special offers in Lincolnshire. It's always worth checking to see what is on offer at the moment. Do you want to holiday near Merlins Lodge (UKC1063), you can see other cottages within 25 miles of Merlins Lodge; have a look to find your perfect holiday location.